One shouldn't confuse the size or the name for weakness. 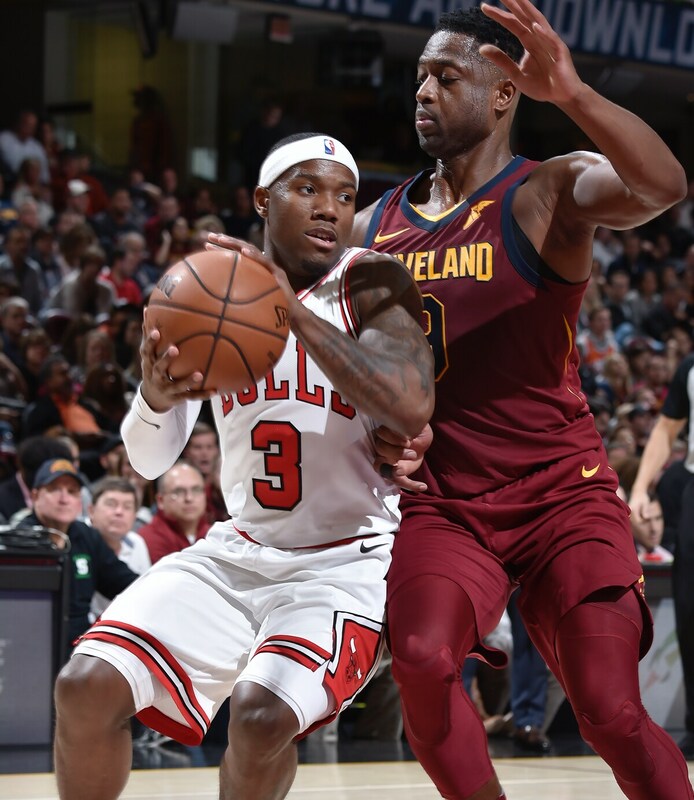 Being listed at 5-9 in the NBA with a name associated more with females in the English language is no reason to overlook Bulls backup point guard Kay Felder. Rather, the name and the measurement reflect determination and accomplishment. "My life has been a fight a fight every day," says Felder, who is averaging 8.3 points in just 15 minutes per game after 13 against the Cavs Tuesday. "I'm ready for it. I'm up to the test. I have a big heart; that's what I say, that I'm all heart. I have a big chip on my shoulder. I don't like to be counted out. So that fuels the fire inside me." And that compact inferno may be heating things up in the Bulls backcourt. The Bulls claimed Felder off waivers just about 10 days ago, and he seems quickly to have become a favorite of coach Fred Hoiberg and another curiosity for when injured point guard Kris Dunn returns to the lineup, perhaps this week. Dunn sustained a dislocation injury in the third preseason game Oct. 6. The timeline was two to four weeks for a return. Hoiberg said Dunn could return Thursday against Atlanta or Saturday against Oklahoma City. Dunn has been somewhat more vague, not specifying when he might be back. "I'm just going to get as many practices as I can and see where my conditioning is, one of these two weeks," he said following the loss to the Cavaliers Tuesday. Hoiberg has indicated Dunn would come off the bench in his return, which presumably would be limited minutes at first. Jerian Grant apparently outperformed Dunn in training camp and got the start to open the preseason. But Dunn was playing his best in that third game against the Bucks, attacking the basket and aggressive like the point guard the Bulls expect of a No. 5 overall draft pick when Dunn was injured. Grant is averaging 10.7 points and leading the team with 7.3 assists per game as the starter in the 0-3 beginning. But Hoiberg also has appeared enamored of Felder's ease to get inside and get off shots. "I thought he gave us a really good lift," Hoiberg said after the Cavaliers' game. "He can really score the basketball. That's who he is, a guy who can get into the paint and when he makes shots like he did tonight (five of 11 in 15 minutes), he's very dangerous. He's developed chemistry with Cris (Felicio) rolling to the rim. Kay has shown the ability to throw that lob pass. That also opens up the perimeter. He's not going to back down; he gets downhill (to the basket instead of side to side). He's always played with a chip on his shoulder and we know he'll give us a good effort." That makes Felder an appealing addition for a Bulls team which needs players to penetrate and beat the defense since that also presumably will open more shots for players like Lauri Markkanen. Markkanen is second on the Bulls in scoring at 16.3 to Justin Holiday at 18.3. But Markkanen is averaging almost five fewer shots per game. The way Markkanen is shooting threes at 46 percent the Bulls presumably would like to get him more shots. The problem for the Bulls is a lack of true point guards. Ryan Arcidiacono had been the backup point guard to open the season with Dunn out. Arcidiacono is a good passer, but Felder quickly impressed with his power, speed and improving shooting ability and won the backup spot. "I'm a competitive person, I bring it every day. That's how I've been my whole life and I'll never stop being like that." Cavs players apparently were having a pool Tuesday about how many shots Felder would take. It was generally agreed it would be double figures. But for a short handed team like the Bulls, it's an advantage to have aggressors. That's been Felder's life story as the undersized man amongst the giants. Not much recruited because of his size, Felder, whose full first name is Kahlil, went to the Horizon League and the Detroit area's Oakland U. He went on to be the league's player of the year as a junior when he led the nation in assists and was among the lead scorers. Felder, 22, declared for the NBA draft in 2016 after his junior season. The Cavs were intrigued after Felder at the NBA combine set a near record for height of his leap. The Cavs spent $2.4 million to buy a second round draft pick from the Hawks and selected Felder. He split time between the Cavs and the G-league and had one nice stretch with the Cavs last December of five straight games scoring in double figures. That came about a month before James called out Cavaliers management for its lack of playmakers on the roster. Though James absolved Felder of blame because of inexperience. The Cavs went on to sign Deron Williams. Felder seemed destined to make the Cavs roster this season, but when Dwyane Wade negotiated his buyout with the Bulls and signed with the Cavs, Felder for roster space was moved to the Hawks and then released. The Bulls picked up Felder for insurance with Dunn out. But Felder's play is making him difficult to ignore. Which often has been the case for the little big man who constantly has defied the doubters. Sort of the NBA's Jose Altuve type. He shouldn't be, but he does. "I feel coming here with a young team we're growing and I'm young and growing," said Felder. "I was also with a vet team with a lot of knowledge. So I figure with this team I can also give the knowledge I got from Cleveland and bring it to Chicago. Just an opportunity for me to grow and figure myself out in this league. "I feel I can bring an aggressive presence," said Felder. "Not necessarily always scoring, but putting pressure on the defense, getting guys open that way; if I have the open shot I'll take it. The size is something I've dealt with my whole life, always being the short guy and things like that. "I look at a guys playing the same position as me who are taller and ask, ‘Say we switch shoes, he comes in 5-9; what will he be?' I'm great with my height," said Felder. "God made me this way. I can't do anything about it, so no need to wish I was 6-2, 6-4. I'm good at 5-9. I'm a competitive person, I bring it every day. That's how I've been my whole life and I'll never stop being like that."